Get started early! Dynamite's baby and toddler classes are designed to foster a love of movement from the beginning while equipping parents with the skills and confidence to hand spot their children. Parents guide their children through obstacle courses while supporting their children as they develop gross motor coordination, strength and self-esteem. CLASS INFO: Mini Sparklers (6mos - 3yrs), 30 minutes, $45 for 5-visit punchcard or $10/child for drop-ins. Register in person. 10:1 student/instructor ratio. Sparklers (18 mos - 3 yrs), 45 minutes, $105/month. 6:1 student/instructor ratio. We all know that gymnastics is a great way to develop physically, but it is also well-documented that it helps preschoolers prepare for school. Learning how to wait, take turns, listen, and develop friendships are critical to kindergarten success. Our classes focus on building social skills in addition to building strength, dexterity and gymnastics skills. CLASS INFO: Poppers (3 - 4yrs), Firecrackers (4 - 5yrs), and Mini TNT (3 - 5yrs) are all coed. 6:1 student/teacher ratio, 45-minute classes, $105/month. At 5 years old, children begin to prefer same-gendered children, enjoy more challenging activities, and tend to be more aware of their connections with their peers and teachers. Understanding these changes, Dynamite provides the choice to graduate from the preschool area and move to the intermediate and Olympic-level equipment; this means thinner beams, higher bars, and bouncier trampolines. Our instructors have a wide range of personalities, so every child can find the perfect match. CLASS INFO: GymFusion (blend of Artistic and TNT) and Trampoline & Tumbling (TNT) classes are coed, Snaps (Artistic Gymnastics) is typically for girls only. 8:1 student/teacher ratio. 60-minute classes, $130/month. By the age of 7, children become much more aware of their physical abilities and the opinions of their peers. To address these developments, Dynamite instructors teach more than just gymnastics--they teach kindness and cooperation. While learning skills, students are encouraged to applaud their peers' accomplishments, and work together to move blocks and play strength games. 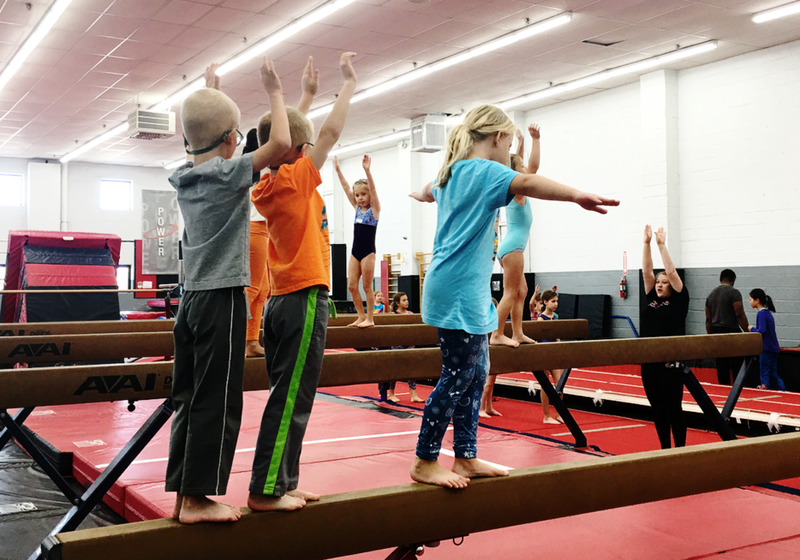 Higher beams and bars help kids overcome fear and feel accomplished. CLASS INFO: GymFusion (blend of Artistic and TNT) and Trampoline & Tumbling (TNT) classes are coed. 60-minute classes, $130/month. Rockets (Artistic Gymnastics) is typically for girls only, 90-minutes, $155/month. 8:1 student/teacher ratio. Middle and high school students are acutely aware of their physique and friendships. At Dynamite, we welcome teens and tweens to have fun and stay active while building positive, supportive friendships. Our experienced instructors serve as role models as they teach students to work together and support one another. CLASS INFO: Trampoline & Tumbling (TNT) classes are coed, Rockets (Artistic Gymnastics) and Tumbling for Cheer & Dance are typically for girls only. 8:1 student/teacher ratio. 90-minute classes, $155/month. You are never too old to learn gymnastics or get back into the groove! As a sport of progressions, starting with a forward roll can lead to a front flip, while former gymnasts can see what they can still do. Our experienced coaches and training equipment will help you meet your gymnastics goals. Prefer trampoline? Develop air awareness and coordination as you learn fundamental skills. Give it a try! CLASS INFO: 10:1 student/teacher ratio. 60-minute class, $130/month.